Professor Wole Soyinka, a great and brilliant Nigerian writer and political activist, who was the first African to win the Nobel Prize for Literature. The name, Wole Soyinka, is a household name both in Africa and beyond especially in the field of literature. With over 50 pieces of work, his writing includes poems, novels, memoirs and a wide variety of essays. He is indisputably one of the best writers in Africa at the moment. Aside from literature, Soyinka is also famous for the active role he played in Nigeria’s political history and its struggle with British colonization and corrupt leadership in the entire African continent. However, these are general facts which almost everyone who has heard the name, Wole Soyinka already knows. Now, if you’ll love to grab the very interesting details of this literary icon’s life, ranging from the big stories to the very little known facts, just relax and read on…! Wole Soyinka was born Akinwande Oluwole Babatunde Soyinka, on Friday, the 13th of July, 1934 in the city of Abeokuta, in Ogun state of Nigeria. His native town is Isara Remo in Ogun State. He is the second out of six children born to his father, Samuel Ayodele Soyinka, an Anglican Minister and Headmaster of St. Peter’s Primary School, Abeokuta, and his mother, Grace Eniola Soyinka, a market trader. He was born into a Christian home and a very rich Yoruba cultural setting where he practised indigenous Yoruba Religious tradition. He therefore, grew up in a setting of mixed traditions – Christian religion and Yoruba traditional religion. His mother was a descendant of the popular Ramsome-Kuti family in Abeokuta, known for her contributions to Nigerian art, religion, education, medicine and politics. Therefore, his cousins include activists Beko Ransome-Kuti and Yemisi Ransome-Kuti, former Health Minister Olikoye Ransome-Kuti, and the legendary Afrobeat musician Fela Anikulapo-Kuti. Wole Soyinka started going to school at the very tender age of two and half years, as a result of his very inquisitive nature. He had both his nursery and elementary education at the St. Peter’s Primary School Abeokuta, before proceeding to Abeokuta Grammar School. He was later enrolled at Government College Ibadan in 1946, at the age of 12 and graduated in 1952, at the age of 18. He went on to do his University preparatory education at the New University College, Ibadan for two years before proceeding to the University of Leeds, England in 1954 to acquire a Bachelor of Arts Degree in English Literature. While at the University, he worked as an editor for the satirical magazine, The Eagle. Following his graduation in 1958, and the attention he got for the two notable plays he published around that time: The Swam Dwellers (1958) and The Lion and The Jewel (1959), he got employed as a script-reader, actor, and director by the Royal Court Theater, in London. In 1960, he was awarded a Rockefeller bursary and returned to Nigeria to study African drama. It was during this time that he founded the theatre group, “The 1960 Masks” and in 1964, the “Orisun Theatre Company“, through which he produced his own plays and also played acting roles. At the same time, he taught drama and literature at various universities in Ibadan, Lagos, and Ife. His works deal with a variety of subject-matters, ranging from comedy to tragedy and from political satire to power struggles of the indigenous people, and also the theatre of the absurd. In 1957, his poems ‘The Immigrant’ and ‘My next Door Neighbour’ were published in the ‘Black Orpheus’, a Nigerian magazine. The same year, his play The Invention, which was his first play ever was produced at the Royal Court Theatre, London. His first major play was the Swamp Dwellers (1958), followed by The Lion and the Jewel(1959), and then, A Dance of the Forests(1960), his first important play. From 1975 to 1999, Soyinka was a Professor of Comparative Literature at the Obafemi Awolowo University, then called the University of Ife. Soyinka has been a Professor of Creative Writing at the University of Nevada, Las Vegas. 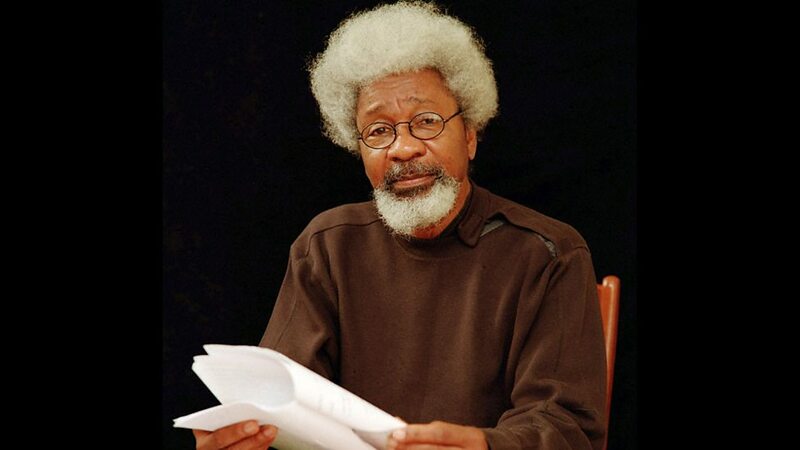 Soyinka has also served as a lecturer in other foreign Universities including Cornell, Emory, Oxford, Harvard and Yale universities respectively. In 1996 he was appointed “Robert W. Woodruff Professor of the Arts”, that was while he taught at the Cornell University. He wrote a good deal of Poems from Prison while he was jailed in 1967–69 for speaking out against the war brought on by the attempted secession of Biafra from Nigeria. In Madmen and Specialists(1970), written shortly after his release from prison, Soyinka’s protest grows much more powerful, perhaps as much a tribute to the playwright’s suffering as to his growth as an artist. Madmen and Specialists dramatize what the NEW YORK TIMES calls, “a police state in which only madmen and spies can survive, in which the losers are mad and the winners are paranoid about the possibility of another rebellion.” Soon after, he also released The Man Died: Prison Notes (1972), a gripping account of his prison experience. Soyinka has been a strong critic of successive Nigerian governments, especially the country’s many military dictators, as well as other political autocrats, including the Mugabe regime in Zimbabwe. He played an active role in Africa’s political history and her struggle for independence from Great Britain, including the fight against South Africa’s apartheid. He unfailingly reflected this stance in almost all his works and this made them be met with much criticism from various angles. In addition to drama and poetry, he has written two novels, The Interpreters(1965) and Season of Anomy (1973), as well as a collection of his literary essays, Myth, Literature and the African World (1975). autobiographical works including and Aké ( 1981), a memoir about his childhood. Some of his most recent works released include King Baabu (2001), a strong, political satire on African dictatorship, In 2002 Samarkand and Other Markets I Have Known, a collection of his poems, printed and published by Methuen(2003), and his latest book of memoirs, You Must Set Forth at Dawn(2006). Soyinka, who has been living and working in the US since 1994 was appointed Professor in Residence at Loyola Marymount University in Los Angeles, California, USA, in the fall of 2007. That same year, still being active in political criticism, called for the cancellation of the Nigerian presidential elections held two weeks earlier, with the opinion that it was plagued by extensive fraud and violence. The noble laureate has been married thrice and divorced twice: He married late British writer, Barbara Dixon in 1958, whom he met during his university days; Olaide Idowu, a Nigerian librarian, in 1963; and finally, Folake Doherty, his former student whom he married in 1989. He had children with the former two and precisely 3 kids with the later. His children include Olaokun Soyinka, Moremi Soyinka-Onijala, Peyibomi Soyinka-Airewele, Makin Soyinka, Iyetade Apampa. 2. Although Soyinka was brought up in a Christian religious family, right in an Anglican Mission compound, attending services, and fully participating in church activities such as Sunday schools, singing in the choir, etc, he grew up to become an atheist! 3. His mother was a descendant of the popular Ramsome-Kuti family in Abeokuta, known for her contributions to Nigerian art, religion, education, medicine and politics. His cousins, therefore, include activists Beko Ransome-Kuti and Yemisi Ransome-Kuti, Health Minister Olikoye Ransome-Kuti, and the legendary Afrobeat musician Fela Anikulapo-Kuti. “If I don’t Prostrate myself to God, why should I prostrate to you”? 5. Wole Soyinka’s first publication, a short radio broadcast for Nigerian Broadcasting Service National Programme called “Keffi’s Birthday Threat”, was broadcast in July 1954 by Nigerian Radio Times. 6. It was from the “Pyrates Confraternity” founded by Soyinka during his University days in Ibadan that University cult groups and secret fraternities evolved. However, Wole never formed the group which involved himself and six of his friends with any evil intentions. Their major aim was to fight corruption and seek justice for students. That was, of course, the first confraternity in Nigeria. 7. Wole Soyinka was imprisoned for a year and 10 months(1967-1969) right from the onset of the Nigerian-Biafran Civil war, for alleged conspiracy, when it was discovered that he secretly appealed to Odumegwu Ojukwu to avert the war. Prior to this Soyinka was arrested in 1964 for allegedly making political radio broadcasts disputing published election results. 8. While imprisoned during the Civil War, he was not allowed access to writing materials. However, he found ways to smuggle in such and therefore was able to produce several poems and other write-ups, still criticizing the Nigerian oppressive government. While still imprisoned, Soyinka also translated from Yoruba a fantastical novel by his compatriot D. O. Fagunwa, entitled The Forest of a Thousand Demons: A Hunter’s Saga. 9. He became the first African Laureate when he was awarded the Nobel Prize for Literature in 1986; with his acceptance speech titled “This Past Must Address Its Present”, dedicated to South African Freedom fighter, Nelson Mandela. The was a major achievement that brought him to the global limelight. The same year, Soyinka was also named Commander of the Federal Republic of Nigeria, and as well won the Agip Prize for Literature. 10. He has been married thrice and divorced twice: He married late British writer, Barbara Dixon in 1958, whom he met during his university days; Olaide Idowu, a Nigerian librarian, in 1963; and finally, Folake Doherty, his former student, in 1989. He had children with the former two and precisely 3 kids with the later. 11. Soyinka’s relentless activism often exposed him to great personal risk, most notably the 5-year exile from home during the regime of General Sani Abacha (1993–98): Soyinka escaped from Nigeria through the “NADECO Route”, the border with Benin on a motorcycle, and then to the United States. General Sani Abacha later pronounced a death sentence on him ‘in absentia.’ He only came back to the country at the onset of civilian rule after the General’s death. 12. He is referred to as the Conscience of the Nation. This is because of his ceaseless concerns and voice against corruption and autocratic government in his country.